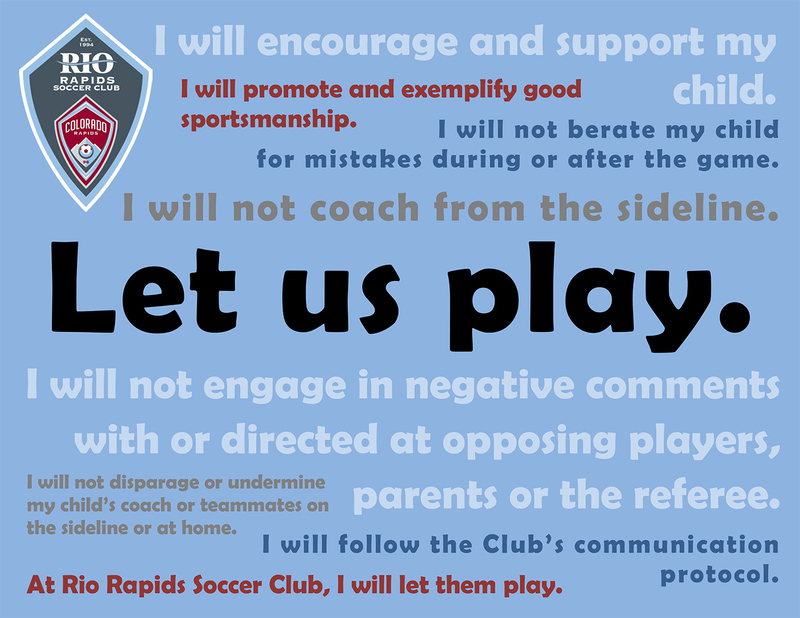 The “Let Us Play” program has been adapted from the Carolina Rapids Soccer Club located in the state of North Carolina. At the Rio Rapids Soccer Club, we feel we have some of the best spectators in the state and in the country. But, we want to make it better. Soccer is a player’s game. Players need to be given the freedom to make decisions on their own without the fear of failure. Instruction from the sideline as well as interference in the referee/player/coach dynamics can affect and influence the game; but more importantly, the development of players. There are three specific components of the game: the players, the coaches and the referees. Parents are spectators – there to enjoy, cheer and watch their children as they play. 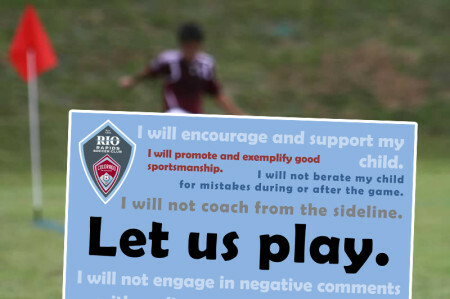 At the Rio Rapids we all sign specific codes of conduct in relation to our role at the club – players, coaches and parents. We are a club that must hold each other mutually accountable for our actions. Both the good and the bad. Let Us Play/Let Them Play Campaign is designed to be fully supportive of the club’s goals and values while not restricting anyone’s participation in their respective role at the club. This is our commitment to you, our members. We will let them play. Get Involved – We ALL Make a Difference. Are responsible for abiding by the code of conduct that they signed. Are responsible for their preparation and performance during the game. Are responsible for their actions on the field in regards to the opponents and referee. Are responsible for making decisions on the field (when to pass and when to shoot, etc.). Are instructed to listen only to their teammates and the coaches during training and games. Are responsible for abiding by the code of conduct and contract that they signed. Are responsible for the safety of the players during the course of the game. They have the authority to take the team off the field if, ultimately, the safety of the players is a concern. Are responsible for communication directed towards the referees. Are responsible for taking action against parents that violate the code of conduct and put the spirit of the game in jeopardy. Are expected to display a manner of professionalism regarding the game, players, parents and referees. Our coaches are role models for our players, their parents, and the club. Are expected to treat officials with respect and dignity and shall teach their players to do the same. Are expected to refrain from all manner of abuse and harassment of others, whether verbal, physical, emotional or sexual, and shall oppose such abuse and harassment. Are responsible for all their actions, including abiding by the signed code of conduct. Are responsible to lead by example. Respect. Are responsible for making sure their child arrives at the field at an appropriate time. Are responsible for helping to establish the proper sideline behavior. Are entitled to report any violations or improper parental behavior towards the appropriate club official. Are responsible for cheering on their child and team and will refrain from verbalizing any instructional comments from the sideline or comments towards the referee crew. Comments towards to the referees will not be tolerated. Rio Rapids SC launched it’s “Let Us Play” campaign below this summer in an effort to foster a healthy environment for youth soccer players, coaches and families. We appreciate the time, money and energy you invest in your children’s youth soccer experience and want to support you in making the gift that you share with your child as rewarding as possible. We would like to share the following video with you titled “I love watching you play”. The message shared by a former professional athlete, current soccer coach and parent of a young child is a valuable message that can help you and your child embrace & succeed in the process of development & competition. Whilst we understand a valuable piece of taking part in youth sports is competition, we feel that learning to love the game, developing as a player and a person are equally important and it is imperative that we keep perspective throughout the developmental process. We hope that you find the time to watch this excellent video helping us as coaches & parents to better understand how we can positively impact our children’s experience in youth soccer. See you all on the fields soon! 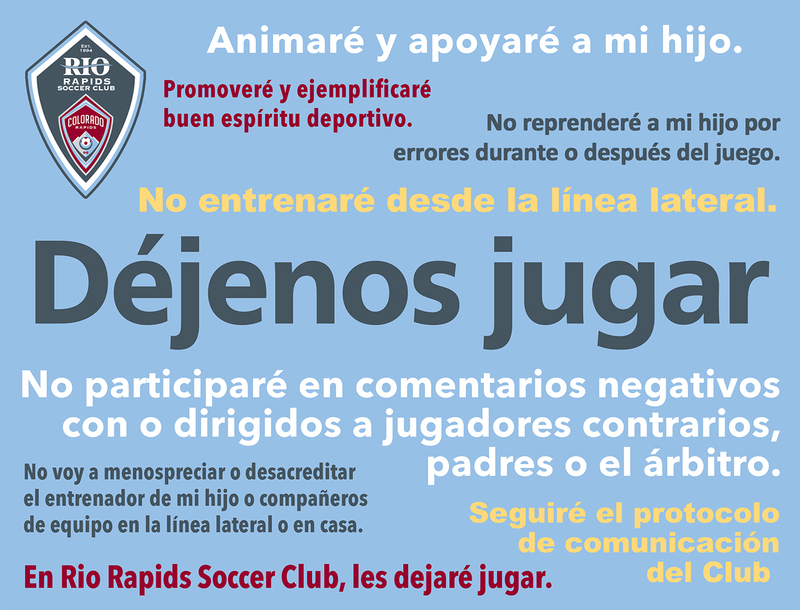 The Rio Rapids SC has a zero tolerance policy in regards to negative comments directed at referees by any spectators, players or coaches. The coaching staff has been instructed to ask any violators to immediately leave the playing area. Ultimately, if needed, players will be substituted off the field due to unruly spectator behavior. Verbal Abuse and/or harassment towards referees will not be tolerated. Any spectator found guilty of referee abuse will have their membership revoked at the club.